Check out the tomato plants [Devon] grew using a monitoring system he built himself. It’s based around a Raspberry Pi. As far as grow controllers go it falls a bit short of full automation. That’s because the only thing it can actuate is the black water line seen hovering above the plants. But [Devon’s] work on monitoring and collecting sensor data should make it easy to add features in the future. The moisture sensors pictured above monitor the soil in which the plants are growing. But he also has temperature and light sensors. These are very important when growing from seed and could be used in conjunction with a heating mat for plants that require higher soil temperatures (like pepper plants). The tomatoes are also pretty leggy. Now that he’s monitoring light levels it would be good to augment the setup with a grow light. A long term goal could even be a motorized bed which could raise the plants right up to the bulbs so they don’t reach for the light. Don’t let the stars in our eyes distract you though. He’s done a ton of work on the project both with the physical build, and in plotting the data collected by the system. Great job! [The Cheap Vegetable Gardener] assembled his first grow controller about three and a half years ago. He’s been very happy with it and knows that he’ll be using it for years, maybe even decades to come. He just finished overhauling the grow controller design to help make sure he doesn’t burn down his garage one day. You have to admit, without knowing anything about the project this rendition does look safer than his original offering. 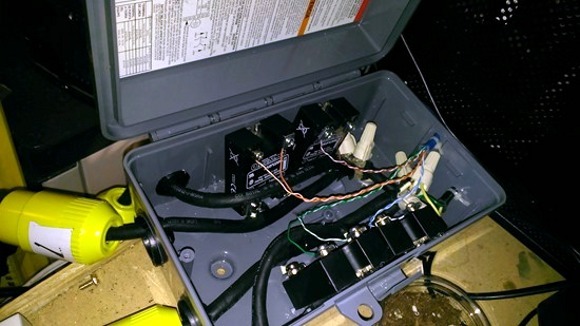 Pictured above is the weather-proof enclosure he used to house four mains-rated solid state relays. This box is isolated from the control hardware, providing heavy-duty utility plugs to interface with the heater, lights, fan, and water pump. He mounted the Arduino board which controls the relays to the outside of the box, using the Ethernet wire to switch the SSRs. It uses a manufactured shield he designed which will help ease the pain of fixing the system if parts ever go bad. Later on in the build he shows the grow light and heaters used in his operation. The heaters simply screw into light sockets; something we’ve never come across before. The Cheap Vegetable Gardner wanted more automation than their previous PS2 controller based grow system. This time they set out to design a full featured, compact grow controller that can measure temperature and humidity as well as control a heat lamp, fan, and water pump. An Arduino provides USB connectivity and interfaces the solid state relays and sensors. The assembled project all fits in a box but we are left wondering how much heat the four SSRs generate and will it be a problem? lancebekistan liked The Omni multi-machine. lancebekistan liked 3 D metal printer.